SCVHistory.com LW3073 | Lebec | L. Wines Richfield Station, Matchbook Cover, n.d.
Matchbook cover: L. Wines Richfield Station in Lebec, n.d.
Richfield used boron as a gasoline additive. It coats the inside of the engine's combustion chamber and fuel intake system with an ultra-thin, low-friction layer that inhibits the buildup of gunk, thus prolonging engine life and boosting fuel economy. It's the same concept as Chevron with Techroline, or Techron, which is a proprietary synthetic polymer detergent. 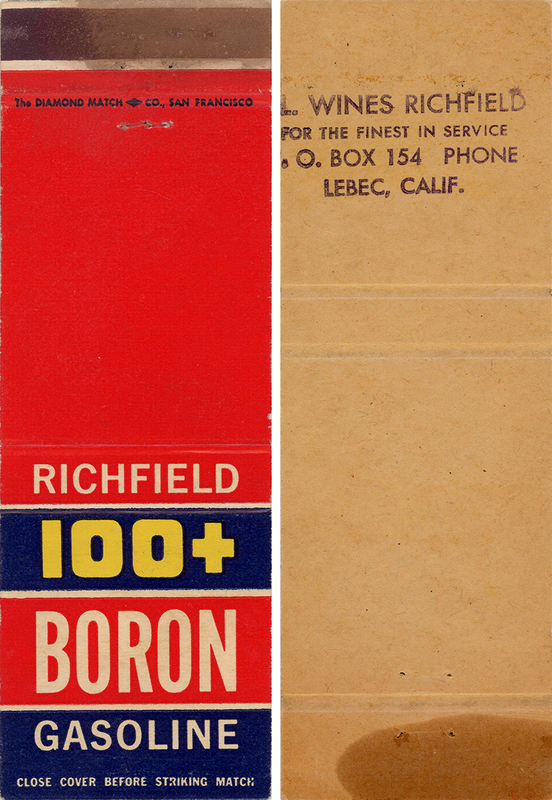 LW3073: 9600 dpi jpeg from original matchbook cover purchased 2017 by Leon Worden.